I have osteoporosis, what can I do? Osteoporosis is a word taken from Greek that means “porous bones,” resulting in a common bone disease in which weak and fragile bones develop over time. Osteoporosis is the result when the body is not able to form enough new bone, compared to the amount of old bone that is continually reabsorbed by the body, resulting in less dense bone tissue. The most common location for fractures related to osteoporosis to occur are the hip, wrist and spine; these are most vulnerable to fall injury. Bone is living tissue just like muscle or heart tissue, and it is constantly being rebuilt, absorbed and replaced. Osteoporosis causes tend to be anything that interferes with the creation of new bone tissue, making it impossible to keep pace with the speed of removal of old bone tissue. In osteoporosis there is an abnormal thinning of bone tissue and loss of bone density over time because the bone mineral density (BMD) is reduced. Because the minerals (primarily calcium) are deficient, the microscopic architecture of all the bones of the body will be reduced and a variety of proteins in bone will also be altered. 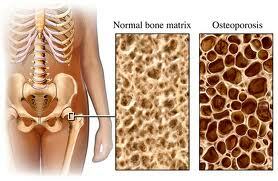 As a result, people with osteoporosis have bones that are structurally weak and can break easily. The leading fundamental causes of osteoporosis are a reduction of estrogen in menopausal and post-menopausal women, and a reduction of testosterone in men. 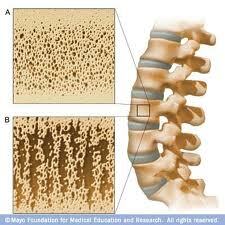 For these reasons women over age 50 and men over age 70 are at risk to develop osteoporosis. The most common form of osteoporosis occurs in women after menopause and is called primary type 1 or postmenopausal osteoporosis. A less common for is called primary type 2 osteoporosis, or senile osteoporosis, that occurs after age 75 and in both women and men at a 2:1 ratio. 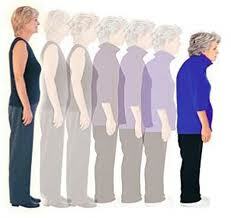 In the elderly osteoporosis is a component of a generalized frailty syndrome that is associated with gradual debilitation that is part of the aging process. Type 2 osteoporosis also occurs as a result the effects of chronic health problems that effect digestion and other metabolic processes in the body, as well as the result of prolonged drug use, mostly steroids. Osteoporosis is a common health condition, affecting approximately 12 million people in the U.S., with 36 million at risk. It women and men of all races, but white and Asian women, especially post-menopausal women, are at greatest risk. In an advanced case something as simple as a sneeze, suddenly bending forward as when reaching too far to pick something up from the floor, or walking up stairs, can cause a bone to break. It is estimated that half of all women 50 years of age or older will break a bone due to osteoporosis, as will a quarter of all men.